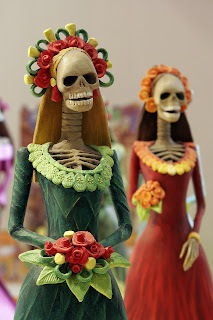 The Day of the Dead (El Día de los Muertos or All Souls’ Day) is a holiday celebrated in Mexico and by Latin Americans living in the United States and Canada. The holiday focuses on gatherings of family and friends to pray for and remember friends and family members who have died. The celebration occurs on November 1st and 2nd in connection with the Catholic holiday of All Saints’ Day which occurs on November 1st and All Souls’ Day which occurs on November 2nd. Traditions include building private altars honoring the deceased, using sugar skulls, marigolds, and the favorite foods and beverages of the departed, and visiting graves with these as gifts. Now, that’s a great holiday.